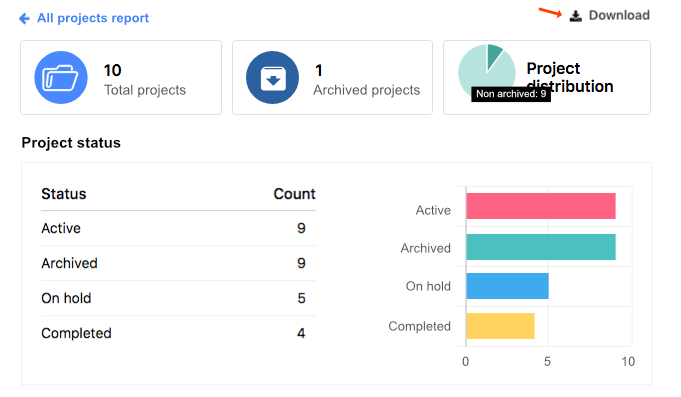 While ProofHub helps you to see where an individual project stand with default Project report and also how a team member is performing with default Resource report, now it also helps you quickly visualize and get a bird’s eye view of where all the projects stand with default All projects report. As soon as you click on All projects report you will get to see detailed report for all the projects based on the project status and project category. Apart from this, All projects report lets you see each project’s information that includes: the manager of the project, project status, due date of the project (if any), count of the assignees and also how much work has been completed i.e. task progress percentage. You can also download the All projects report and use it in meetings or however you want to plan and schedule the projects accordingly. All projects report comes handy when you want to quickly see how all the projects are progressing, how many team members are assigned a project and if there’s a need for more or less people to work on them, and also plan how projects accordingly. Can’t find the answer to your questions? Contact ProofHub Support.